Kiriaki Melliou is kindergarten specialist at the Directorate of Primary Education in Piraeus and PhD Candidate in the Department of Early Childhood Education of the University of Western Macedonia, Greece. Our story begins at the International Visible Thinking Conference in Miami, Florida, where Shari Tishman presents “Out of Eden Learn” – an online community in which students from different schools accompany Paul Salopek in his 7-year-long epic walk around the globe. I immediately wanted to join this unique learning community. So, shortly after the conclusion of the session I asked Shari if I could register my Greek-speaking kindergarten class on the platform. I still remember her words to me: “I’m very excited that you’ve decided to join Out of Eden Learn. I wish you a bon voyage and I will watch for your class’ participation online.” I couldn’t have asked for a more encouraging welcome. Back in Athens, while browsing some of Paul’s milestones and resources, I felt quite puzzled as to whether the non-English-speaking students of a public school in a low-income district of Piraeus would be able to overcome the language challenge and respond to the requirements of each footstep’s activities. Today, after having experienced this amazing learning journey, my thinking has completely changed and I see things from a completely different perspective. Below I explain how my thinking has changed. This new perspective of looking at common things through different and more “patient” lenses encouraged children to become critical of their own situated assumptions about their immediate environment. 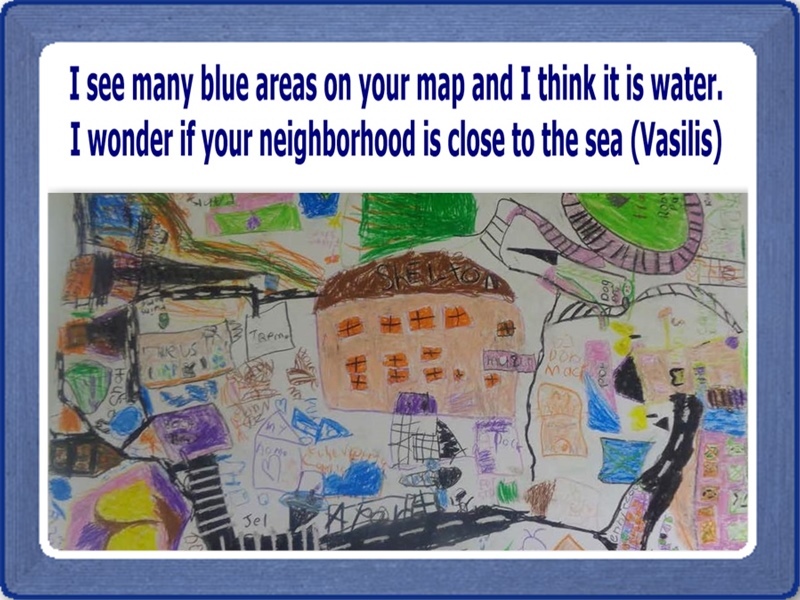 Upon returning to the classroom after this thoughtful walk, children used different media to share their initial ideas about the neighborhood as well as their shift in thinking (see below). 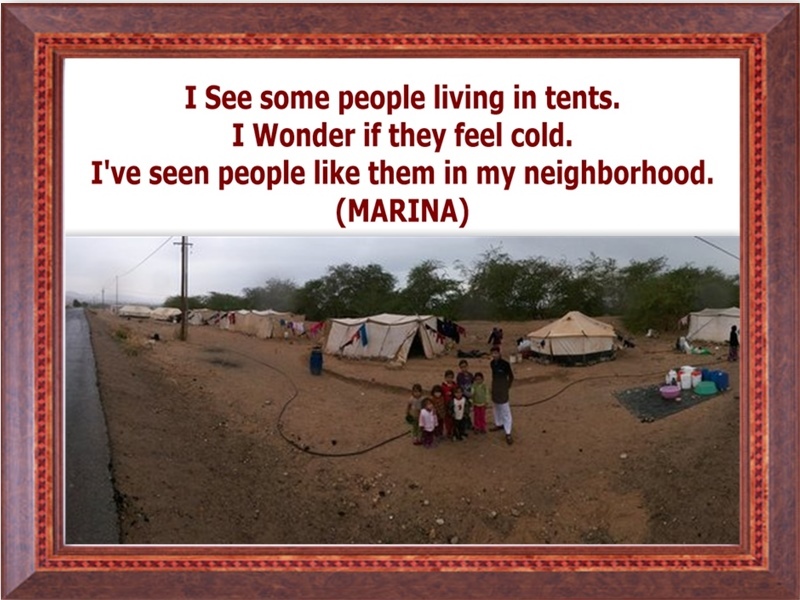 I used to think that young students’ ability to be sensitive to others’ feelings is limited, but now I know that listening to the stories of others can nurture children’s understanding of humanity: In each footstep we were asked to engage with Paul’s journey and connect our personal stories to the stories of people around the world. Although we needed to simplify the language of Paul’s stories to make them accessible to the children, these social narratives became a very powerful tool for cultivating their understanding and “sympathetic imagination1” with regards to different perspectives. Paul’s stories became a means for them to explore some of the differences and similarities that existed between themselves and other people from around the globe (see right). But the biggest advantage of viewing the world through the stories of others was that it helped to develop a culture of respect for human diversity and complexity. I used to think online communication among young students might be superficial, but now I know that online communication can become an effective means of fostering critical thinking skills: I have been using asynchronous communication for many years in my classroom, but when looking across the exchanges among children I always noticed that they were quite impersonal and superficial. What makes a real difference on the Out of Eden Learn platform, however, is the Dialogue Toolkit, which is designed to support meaningful communication between students of different nationalities living in different countries. During each footstep children were encouraged to brainstorm and structure the questions to their “distant” friends using the vocabulary of several thinking routines. Soon, all comments became more thoughtful, which allowed children to develop reflective interactions with their peers (see left). I used to think that young students cannot understand abstract and ambiguous concepts, but now I know children are able to extend knowledge beyond what is obvious and already known: In his book “Making Learning Whole”, David Perkins2 talks about two widespread diseases of the educational system, namely “elementitis” and “aboutitis.” In my view, many early childhood educators suffer from “aboutitis”: the inability to go deep into any subject. As a result, young students are not able to grasp and interpret the deep insights of a topic. Out of Eden Learn has a strong mechanism that prevents it from such “virus infection” and that mechanism is called “Paul’s material”. In Footstep 5 children had the opportunity to critically review their concepts about culture through Paul’s “River of Culture.” This inspiring resource served an important function for a range of cognitive tasks including a) examining the validity of their prior knowledge [culture was described as the differences children see in people and the way they celebrate life (Pic. 1)], b) identifying elements that extend their ideas beyond what is already known [culture emerged as different features that connect with each other (Pic. 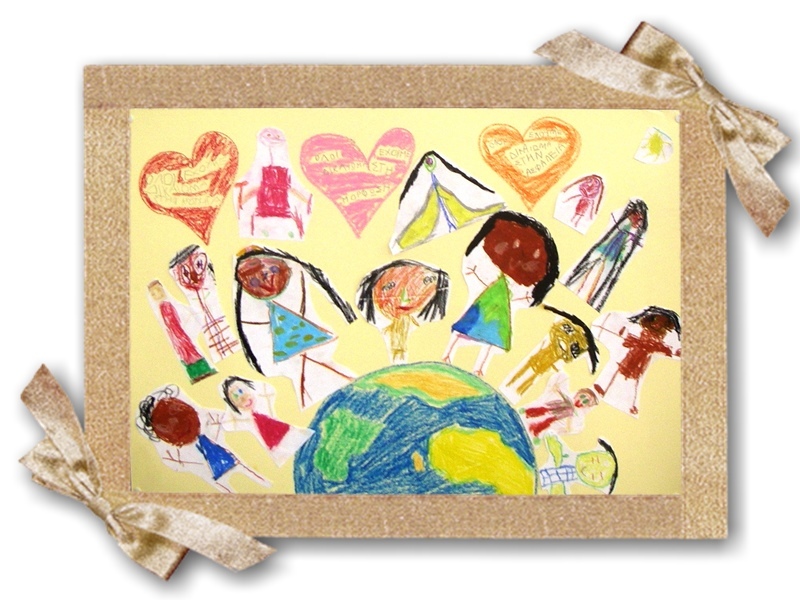 2)], c) projecting themselves into the culture [children used their bodies to turn their ideas of culture into reality (Pic. 3)] and d) developing wonderings about the unknown (children wondered if culture disappears when people disappear, if it leaves signs behind and finally if Paul’s culture would change after the end of his long walk3). Finally, when the story began I used to think putting English words to Greek experiences would be quite challenging, but through this thoughtful journey I’ve learned that experiences are not only conveyed by words but also sensed by slowly looking at visual representations. I’d like to invite all non-English speaking early childhood educators around the world to consider taking the vocabulary challenge and join the Out of Eden Learn community because the stories and experiences that are shared here go beyond any language barriers. To philosopher Martha Nussbaum, sympathetic imagination requires imaginative and emotional receptivity and demonstration of a capacity of openness and responsiveness. To me, this involves imagining another’s perspective and building a greater understanding of differences and similarities. Nussbaum, M. (1997) Cultivating Humanity: A Classical Defense of Reform in Liberal Education, Harvard University Press, Cambridge, MA. Perkins, D. N. (2009). Making learning whole: How seven principles of teaching can transform education. San Francisco, Calif: Jossey-Bass. Students from 1st Neo Faliro kindergarten have filmed a thought provoking video about culture. Very interesting presentation, which destroys many of our traditional beliefs about the capabilities of children, and the dynamic of their education. Thank you! ← What does a seven-year journey around the world have to do with kindergarten students in São Paulo?